"Your JET Packs have improved communication within IT and our customers, and my CIO loves it." Improve Customer Satisfaction Overnight with Best Practice Notifications. 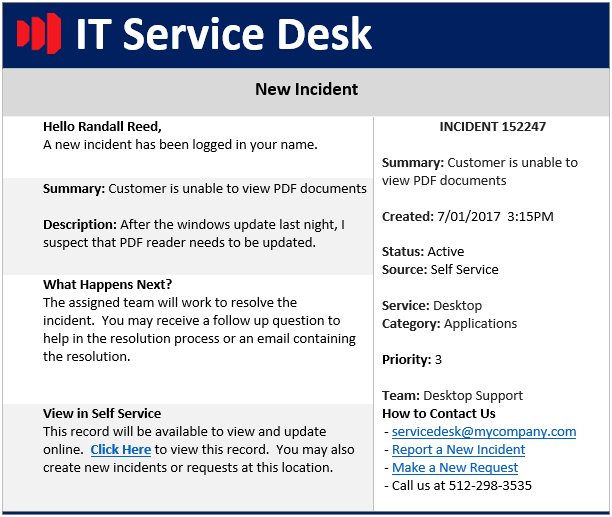 Did you know that sending organized and informative emails increases customer satisfaction and will immediately improve the relationship between your service desk and the customer? ​What's the fastest and easiest way to do this? Put on a Dataseti JET Pack! What is a Dataseti JET Pack? A Dataseti JET Pack is a set of best practice journaled email templates, used to boost communication within the organization and customer satisfaction for the Ivanti Service Manager ITSM platform. We've spent decades understanding what it takes to unify departments through great communication and making happy customers, so we bring you JET packs to help you get there fast and easy. A JET appears in the body of outbound emails to your organization's users and customers, replacing the plain and boring text found out of the box. Not only do JET Packs enhance emails to all, but sends THE RIGHT information at THE RIGHT time. Click on the modules (blue bars) below to see JETs in each JET Pack. Option 1: Best Practice JET Pack Purchase a JET Pack for the module you want. If you have additional emails templates that are not out of the box, update those too. Includes up to 4 hours of configuration assistance. Option 3: Your own Custom JET Pack Design Like option 2, but you give us template design. Instead of spending days or months perfecting one single template, let us JET it! We will build a fresh template for 10 unique, one of a kind JETs. Includes up to 10 hours of configuration assistance. Option 4: Get a JET Ton You may have hundreds of custom email templates you want to improve. We can meet with you, scope the project and give you a customized quote. Like the options above, you'll get the power of our certified ITIL and ITSM experts, and the peace of mind found only in our JET tech and experience.